The HUAWEI nova 3 is the first phone that comes with the latest version of Huawei's custom skin EMUI. Besides, Huawei has also tweaked up the design to make it look more modern. Examples include a new weather widget for the home screen as well as the notifications pane that is now White instead of Black. The quick toggle icons look much better on the lighter background and give the phone a cleaner look. One of the highlights of the HUAWEI nova 3 is the pair of cameras present on the front. These cameras are powered by AI that, according to Huawei, intelligently recognise the surroundings to instantly create the "most amazing AI selfie." 2. Back camera not flagship level. The Huawei Nova 3 is launched in India. The smartphone sports a 6.3 inch IPS LCD display, with a resolution of 1080 x 2340 pixels, a 19.5:9 aspect ratio and an 85 percent NTSC colour gamut . Under the hood, it is powered by an octa core Huawei Kirin 970 processor that sits Mali-G72 MP12(GPU Turbo). Besides, the unit is coupled with 6GB of RAM and 64GB or 128GB as the storage choices. That can be expanded up to 256GB via microSD card. In terms of optics, it sports 16 MP + 24 MP dual camera setup at rear, which is AI powered. Up front, the unit has a 24 MP primary sensor along with a 2 MP secondary sensor. The dual camera set up on either side is AI powered. Connectivity aspects on board the Nova 3 include Wi-Fi 802.11 a/b/g/n/ac, dual-band, DLNA, WiFi Direct, hotspot, v4.2, A2DP, EDR, LE, USB Type-C, with A-GPS, GLONASS, BDS and dual sim (nano + nano/microSD). It packs a non-removable Li-Po 3750 mah battery, supporting Super Charge technology that tops up half the battery in 30 minutes. It runs Android 8.1(Oreo) topped by EMUI 8.2 out of the box. Sensors on the phone include Fingerprint sensor, Light sensor, Proximity sensor, Accelerometer, Compass, and Gyroscope. The smartphone is available in Indian market in Black, Blue, Gold and Purple colors. 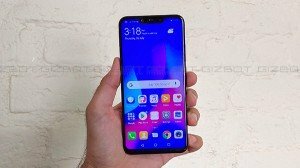 The Huawei Nova 3 is priced at Rs. 34,999 for 6/128GB variant. Huawei P20 Pro, Nova 3 to receive Android Pie-based EMUI 9.0 update soon. The Android Pie-based EMUI 9.0 update was announced by the company back in October 2018. Huawei Nova 3 all set to go on open sale in India today but only for Amazon Prime members, for other the sale will starts from August 23. All you need to know about the smartphone. While Huawei has brought phenomenal smartphones in the market, the company has occasionally been caught involved in the acts of deception. This has now led to the belief of whether the Chinese smartphone giant is honest with its consumers or not.